This holiday season will be the last for Granville’s traditional Christmas tree. The tree, in Veterans Park, is clearly unhealthy, and LaRose asked Laura McDermott, the extension educator at the Washington County Cornell Cooperative Extension to examine the tree. Her determination was that it has a disease in at least two areas and most likely cannot be restored to health. 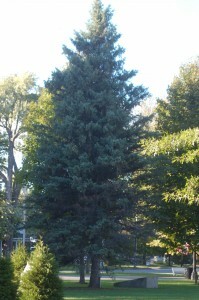 “After looking at the tree and observing the needle cast disease on the lower and north side of the tree, I feel it would be very difficult to bring the tree back to the condition that most village residents expect for a specimen located in such a high profile location,” she wrote in a letter to LaRose. She went on to say that the tree is located too close to the maples in the park and growth for both species would be hurt by leaving it where it is. She said she did not feel there was a good place to site the tree that would not break up the sweep of the park’s lawn. She suggested the village conduct fundraising and bring a holiday tree in every year rather than placing another in the park. LaRose said he feels there may be potential site in the park to plant another tree.